How did a history and art history graduate end up writing about science? I blame it on Dr. David Suzuki. Specifically, I blame it on a 30-year-old episode of the radio program Quirks and Quarks, which Suzuki hosted, and on a talk he gave to a group of booksellers some 25 years ago. In both cases, the stories he told lodged themselves in a corner of my mind and slowly, slowly pushed science to the forefront of my interests. The Quirks and Quarks episode was a presentation of ordinary citizens grappling with a new aspect of science in an extraordinarily thoughtful way. It showed a community somewhere in New England faced with a proposal for a laboratory examining recombinant DNA. Back then, for the ordinary layperson, recombinant DNA was the stuff of science fiction or nightmares or both. As I recall, Quirks and Quarks broadcast parts of the public hearings over at least two episodes, devoting hours to the topic with very little editorial comment. We simply heard ordinary people informing themselves, working through questions and coming up with their conclusions. The lab was allowed. When David Suzuki spoke to the booksellers a few years later, he began by discussing the all-too-common idea that science doesn’t have anything to do with one’s day-to-day life. Intellectually, I agreed with Suzuki that this idea was wrong, but, frankly, science didn’t seem to have much to do with my day-to-day life either. Suzuki pointed out that, when he was a child, he wasn’t allowed to go to the movies or the swimming pool because of polio scares. As someone who had measles before there was a vaccine and who had seen the results of childhood polio in 1980s Africa, his statement hit home for me. He detailed other ways that science had changed his and everyone’s lives, but what I remember was the vaccines – the very ordinary way that children’s lives have been changed in ways today’s kids can scarcely imagine. Over the years, I have recalled and reflected on the stories Suzuki told, as I gradually became more interested in writing about STEM topics. These two episodes showed both the ways in which ordinary people’s lives can be affected by science and the way ordinary laypeople can grasp and make intelligent decisions about science. 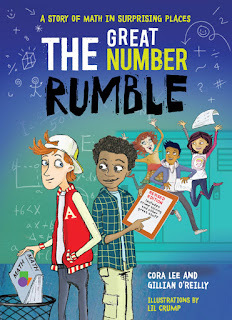 So I write about STEM subjects, not just for the budding scientist, but for the kids who will grow up to be historians or artists or school principals or lawmakers – all of whom will need to understand and make intelligent decisions about the wonderful science around us. 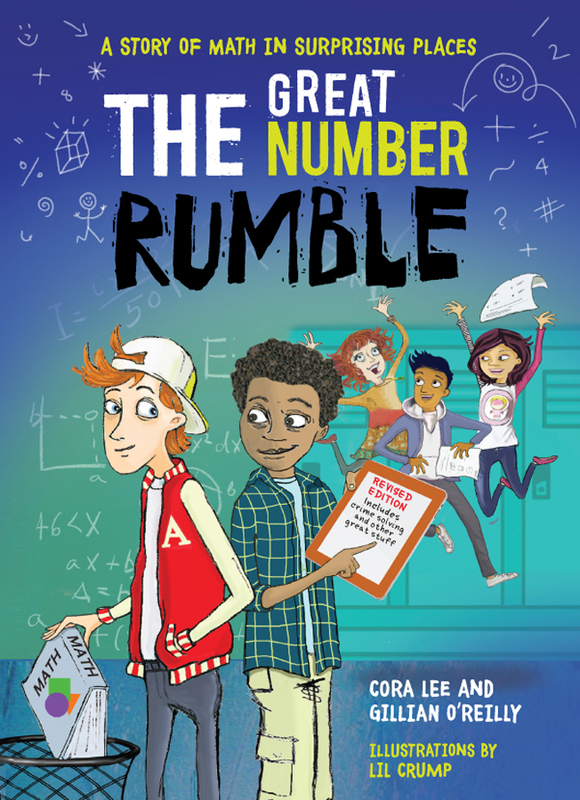 Gillian O’Reilly is the co-author with Cora Lee of The Great Number Rumble, Revised and Updated: A Story of Math in Surprising Places (Annick Press, 2016), illustrated by Lil Crump. Ruby LOVES to "play dead" so we can will bury her in snow! I love early spring! And no – I’m not talking about tulips and the return of migratory birds, though I have nothing against those things. 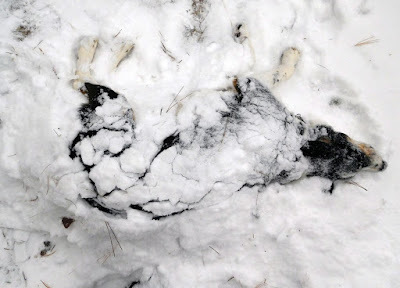 I’m talking about earlier, in the first weeks of March, when there’s still plenty of snow on the ground, when, for all intents and purposes, it’s still the dead of winter. 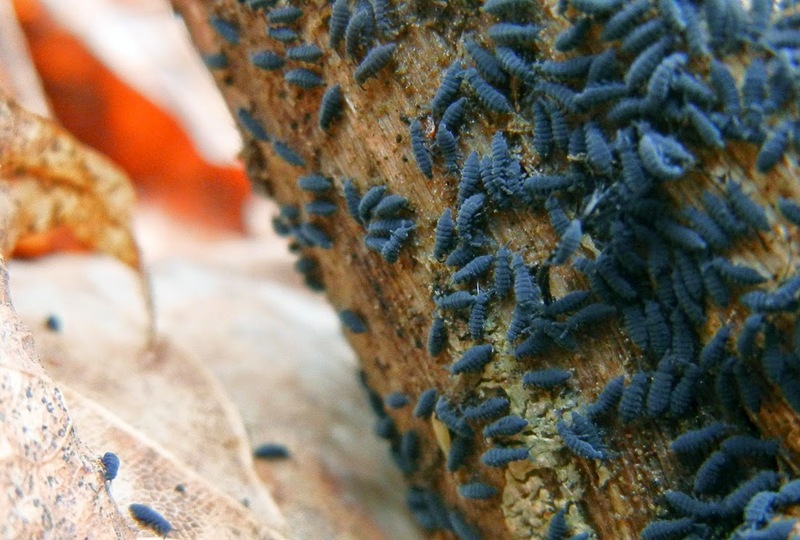 Minute snow fleas appear on warm days in late winter. 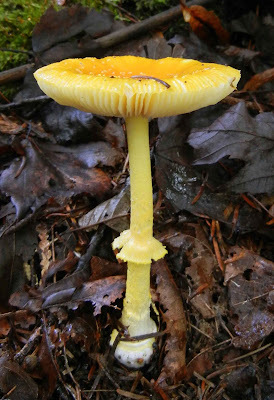 In fact, there’s a surprising amount of life in the late winter forest here in Ontario – especially when the temperature squeaks a few degrees above the freezing mark. By early March, tree sap has begun to flow. Within a few days, deciduous crowns in the distance have taken on a haze, as if someone has smeared wet watercolour across the tips of their sharp branches. Their leaf buds are plumping. Male chickadees start using their “Hey, sweetie,” song, which, I think, is self-explanatory. Skunks wake from their winter torpor and amble about briefly – possibly just to stretch their legs – before returning to their dens to wait for real spring to come. On sun-warmed snow patches at the base of trees, snow fleas congregate, sometimes by the tens of thousands (see my post about snow fleas here). will drop spores on warm winter days. And, all over the forest—believe it or not—fungi are procreating like crazy. 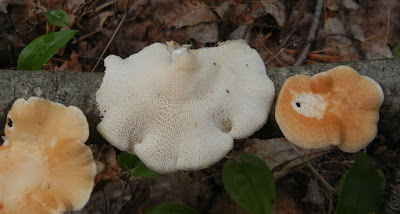 These are not your basic ground mushrooms with caps and stems that you see in summer and fall. Most of those are mycorrhizal, and have a mutualistic relationship with trees, trading underground water and nutrients for the sugars that trees produce. But trees shut down sugar production in the late fall, so the underground networks of mycelia of mycorrhizal fungi also shut down during the frozen months. The Violet-toothed polypore (Trichaptum biforme) is an annual saprobe. 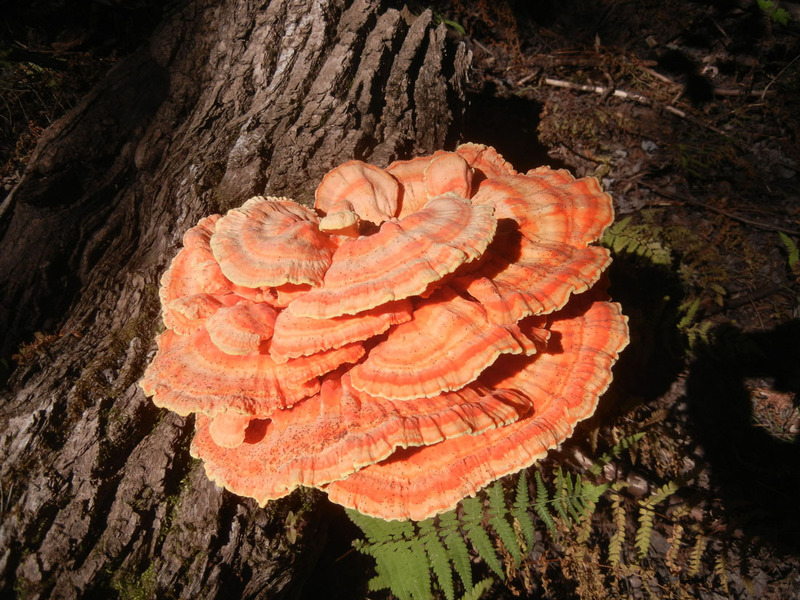 But there are all kinds of other fungi that have a different kind of relationship to trees. They rot them. Many of these tree decayers, or saprobes, are polypores. Polypores develop their spores inside tiny tubes instead of on gills like store-bought mushrooms. 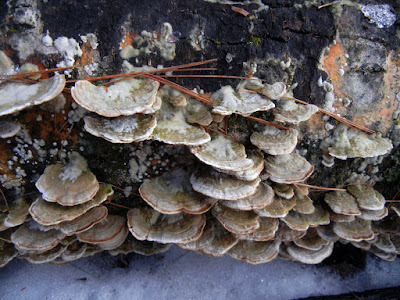 The most commonly noticed polypores are shelf fungi or conks. 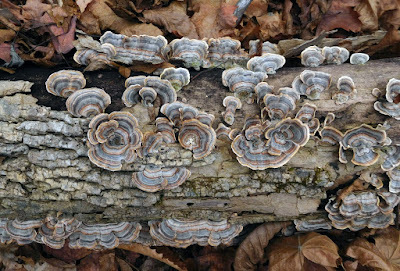 Many are perennial – they have skeletal hyphae—tissue than can withstand freezing and thawing—and just keep growing and growing, sometimes for 70 years or more. 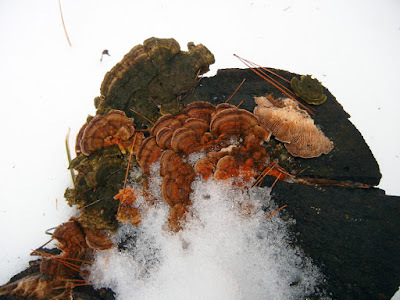 And during that time, whenever the temperature goes above freezing for a couple of days, these fungi produce spores. new spore-producing tubes on its underside each year. But, why, you might wonder would they send out spores so much earlier than the birds start doing it and the bees start doing it—when the forest is still, in effect, asleep? The Gilled Polypore, Lenzites betulina, has elongated tubes that almost look like gills. 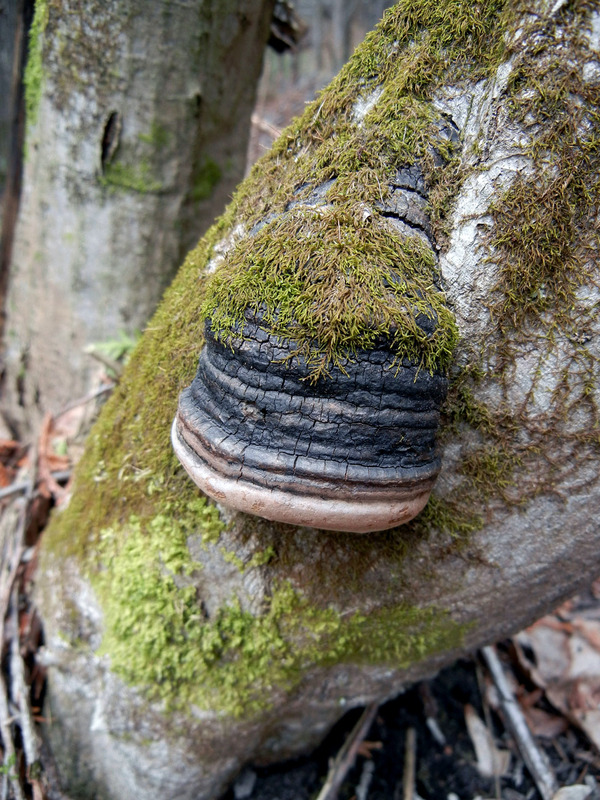 They do it early because polypores, like all fungi, are opportunistic. 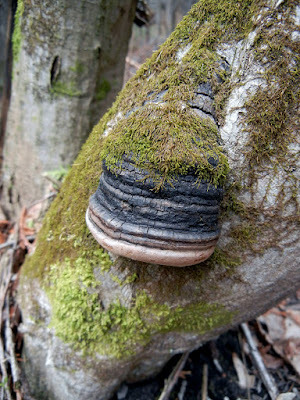 Polypores that grow on living trees usually inhabit the heartwood that runs up the core of a tree trunk. 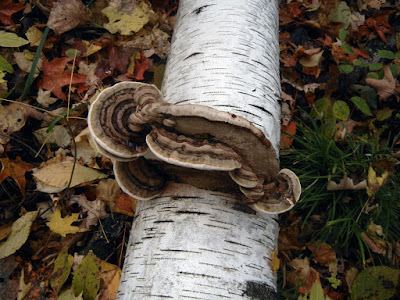 To set up shop in this deadwood, a polypore has to get past a tree’s sapwood, the living layer below the tree’s bark. 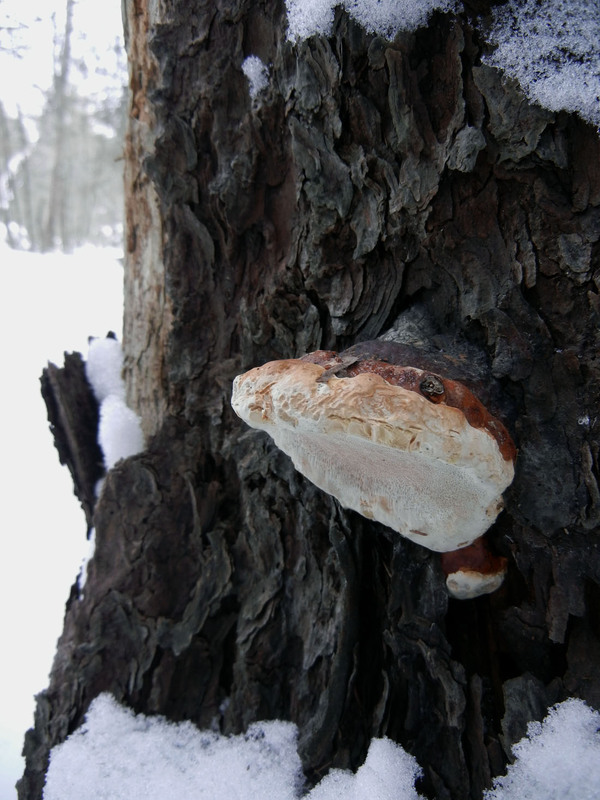 In the winter, deep freezes cause fractures in tree bark. These frost cracks are perfect for catching passing spores. When spring rains moisten the crevices, and before the tree has time to seal these cracks, the spores germinate and their mycelia work their way into the core. 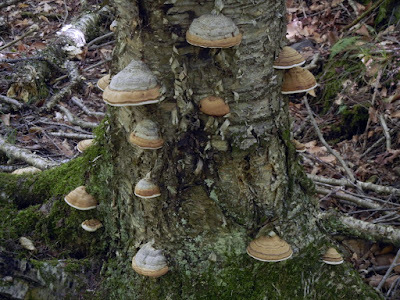 Once past the tree's defences, the fungus sets up shop, spreading its mycelia up and down and around. A fungus can secretly live inside a tree—gradually breaking down lignin and cellulose—for many years before it gives us humans a clue of its presence—by producing reproductive organs (shelf fungi, or conks) on the tree’s exterior. before matches were invented; Ötzi was carrying some). 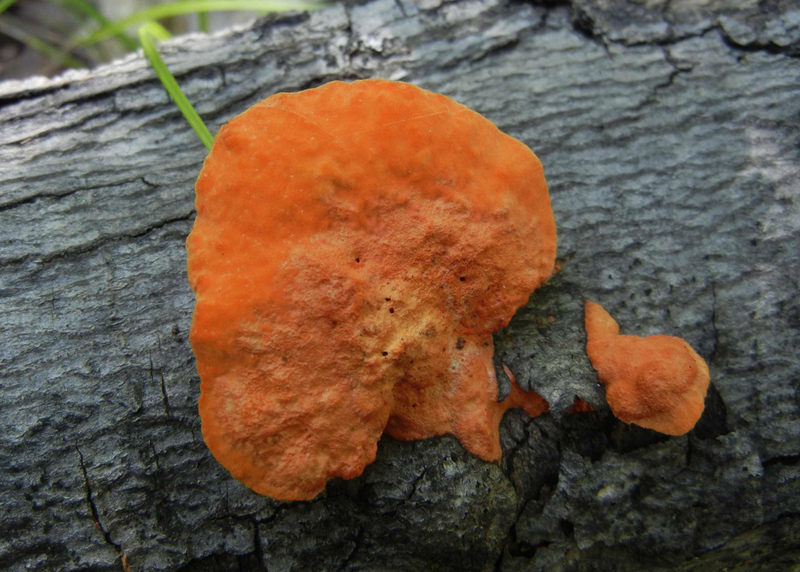 The Cinnabar Polypore (Pycnoporus cinnabarinus) is the colour of dragon's blood! chicken if you miss its succulent stage. 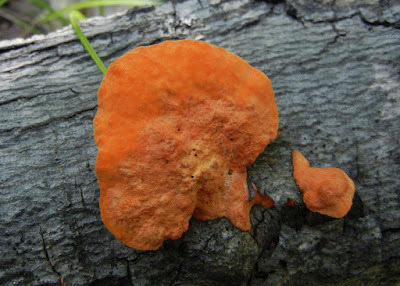 fell, added new growth with its pore surface—once again—facing down. From the website of the research ship, Okeanos Explorer: "From March 7 – 29, 2017, NOAA and partners will conduct a telepresence-enabled ocean exploration expedition on NOAA Ship Okeanos Explorer to collect critical baseline information about unknown and poorly known deepwater areas in the Howland and Baker Unit of the Pacific Remote Islands Marine National Monument and the Phoenix Islands Protected Area. NOTE: ROV dives are planned, weather permitting, most days from March 8 - March 27, typically from about 8 am to 5 pm WST (March 7 - March 26, from 2 pm to 11 pm EDT)." If you go to the dive website, you can watch the whole of the dive, seeing just what the scientists are seeing, and you hear scientists discussing what they are observing in real time. Warning: it's addictive! the surface of the Pacific Ocean. 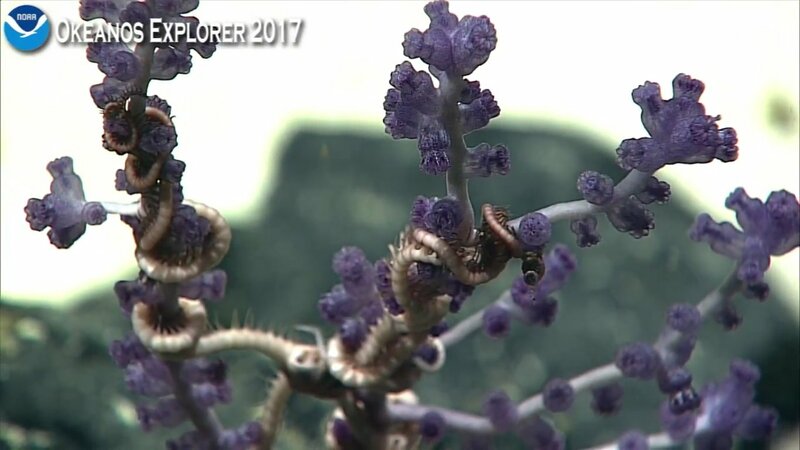 Screen capture from Okeanos Explorer feed. In Honour of Saint Patrick's Day - SNAKES! 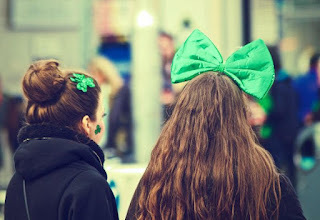 This day, March 17, is St. Patrick's Day, celebrated around the world by the Irish, the formerly Irish, the wannabe-Irish, and beer drinkers of all persuasions. It's generally marked by a lot of green - green clothing, green-dyed flowers, green-dominated parades, and that abomination - green beer. But no snakes. Snakes almost certainly don't celebrate St. Patrick's Day (even though many of them are noticeably and naturally green). After all, St. Patrick is famous for driving the snakes out of Ireland. But did he? 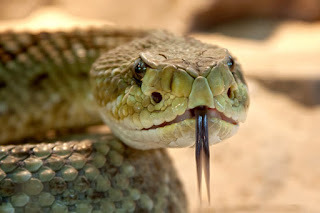 Sadly for legend, Ireland was snake-deprived long before St. Patrick arrived more than 1500 years ago. The cold temperatures and ice sheets of the last major glaciation drove snakes and other reptiles south. When the world warmed up about 10,000 years ago and the snakes moved back north, they were blocked by the cold waters of the Irish Sea. The few snakes that made it that far north simply settled down among the forests and hills of Britain and left the island of Ireland alone. The Irish probably don't regret the lack of snakes, but they might be missing something. Snakes are amazing and quite beautiful. A few years ago, I wrote a book about animals adapting to extreme habitats (Lizards in the Sky: Animals Where You Least Expect Them) - and one of my favourite examples was the flying snakes of Southeast Asia. 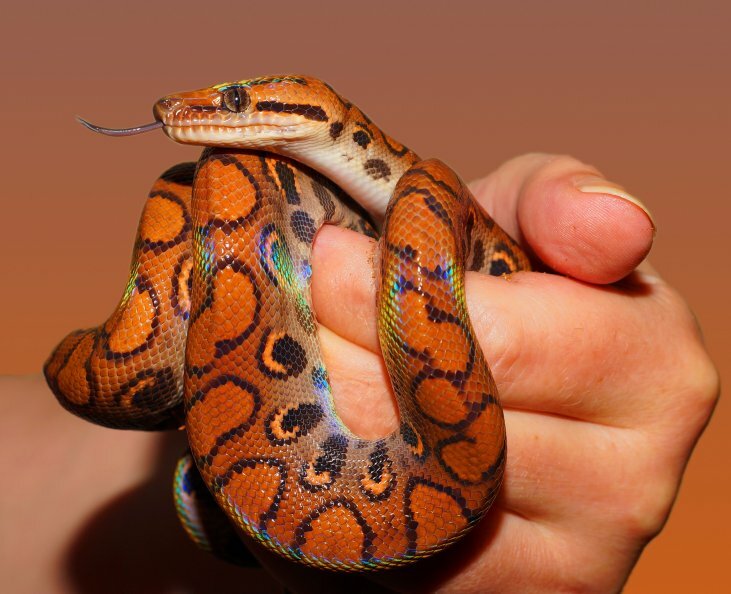 The elegant rainbow boa is popular among collectors. "Flying snakes?!?" you ask. (Well, most people ask that.) Really and truly! 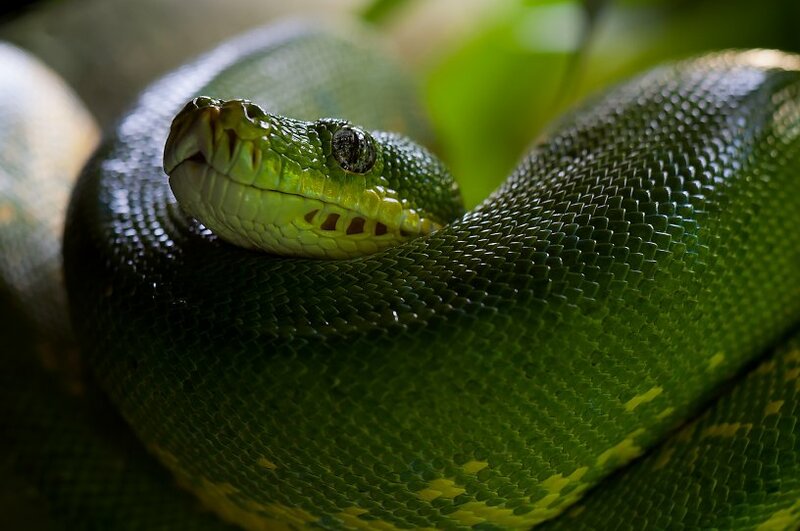 A small group of snakes in the jungles of Malaysia and Borneo has developed the ability to glide through the air. They fling themselves from a high branch, flatten out their bodies, and swim through the air in a wriggly glide. The most accomplished species, the paradise tree snake, has been seen to glide more than 20 metres - far enough to take it safely over a five-lane highway with room to spare. And then there are the swimming snakes. "No, no... not swimming snakes too!" you cry. (I'm sure I heard you cry that.) Yup. Sea snakes, in fact. which direction the smell comes from. Actually, sea snakes are quite common in the warm waters of the Indian and Pacific oceans, but most of them stay in the shallows close to shore. The exception is the yellow-bellied sea snake, which is born at sea and lives there its entire life. Coolest fact? The yellow-bellied sea snake can tie itself in a knot. It loops around itself into a simple knot and runs the loop from one end of its body to the other to scrape off parasites and dead scales. See what you're missing, Ireland? Claire Eamer likes strange animals and weird facts and science of almost any kind. Her latest book is What a Waste! Where Does Garbage Go? (Annick Press, 2017). You've probably heard about scientists using photos of whale flukes to identify individual humpbacks. Did you know that a similar strategy is being used to count and identify zebras? Originally called StripeSpotter, it's a barcode scanner. A barcode scanner for zebras. Basically how it works is, scientists take a photo of the zebras. They feed the photo into StripeSpotter, and the computer finds unique characteristics in the stripe pattern of the zebra's coat. Any time that zebra is photographed again, it can then be checked against the database and identified. This is supercool, because, unlike supermarket barcode scanners, where you have to hold the package at just the right angle while doing a little dance for the scanner gods, StripeSpotter works on "noisy" pictures. The kind that you're likely to get when shooting long-distance photos of a whole herd of zebras while riding a bouncy jeep across a dusty savanna. StripeSpotter also works on spotty animals, like giraffes, so it's flexible too. Why does this matter, you ask? There are lots of reasons scientists need to know which animal they're looking at. For one thing, being able to identify individual animals makes it possible to count them. Counting helps scientists figure out whether a population is growing or shrinking, and, by extension, whether the species is endangered. It's also really helpful to know what individual animals are doing out there in the wild - whether they migrate or stay put, what they're eating, whether they are reproducing... the possibilities are both important and endless. For more info on the technology and what it's being used for, click here. 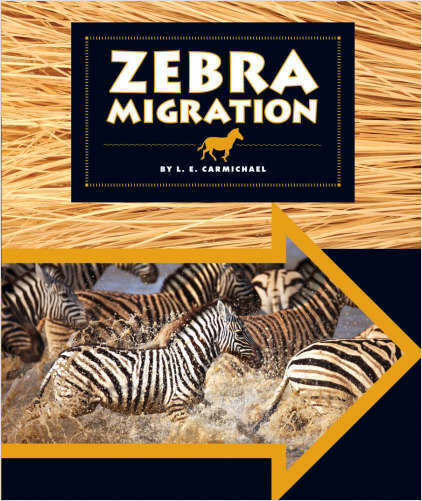 And for more info on zebras, check out Zebra Migration, for ages 6-9!